Gertrude E. Harmann, 95, Algoma, passed away Monday, May 14, 2018 at Door County Memorial Hospital after a brief illness. She was born July 20, 1922 in Brussels to the late Ernest and Louise (Hafemann) Kroening. Gertrude married Victor Harmann July 20, 1942 at St. Paul's Lutheran Church, Algoma. The couple farmed and also purchased and operated the Algoma Farmers Feed Mill for 25 years before selling due to Victor's ill health. She had various other jobs throughout her life including 19 seasons at the Meleddy Cherry Factory after retirement. 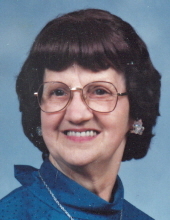 Gertrude was a member of St. Paul's Lutheran Church. She was an avid volunteer in her retirement years including a member of St. Paul's Ladies Aid, Algoma Hospital Auxillary, Women's Club, the Thursday Golden Agers Club (President for 20+ years), and also attended the Tuesday Card Club and the Algoma Meal Site. Gertrude enjoyed time spent with family and friends (especially with her only grandchild born in 1997), playing sheephead and gardening. Gertrude is survived by her daughter Linda Mohr, grandson Joseph Mohr, one sister Johanna (Henry) Opicka; nieces and nephews. she was preceded in death by her parents, husband Victor on October 29, 1983; two brothers and one sister-in-law Clifford (Maxine) Kroening and Orville Kroening; one sister and brother-in-law Loretta (Jerome) Franda; sisters-in-law and brothers-in-law Myrtle (Elmer) Mickelson, Lawrence (Josie) Harmann and Hazel Harmann; nieces and nephews. Family and friends may gather at the SCHINDERLE FUNERAL HOME, Algoma, from 4:30 - 7:00 PM, Thursday May 17, 2018. Prayer service 7:00 PM. Visitation will continue Friday from 10:00 AM until the time of services at 11:00 AM at St. Paul's Lutheran Church, Algoma, with Rev. John Moll and Rev. Joel McKenney officiating. Burial in the Evergreen Cemetery. Linda and Joseph would like to thank Jennie and the staff at Bay Road Place for their love and care the past three years Gertie called home and also faithful visits from family and friends. To send flowers or a remembrance gift to the family of Gertrude Esther Harmann, please visit our Tribute Store. "Email Address" would like to share the life celebration of Gertrude Esther Harmann. Click on the "link" to go to share a favorite memory or leave a condolence message for the family.